As frontman with Queens Of The Stone Age, Josh Homme is arguably the biggest name in rock music. 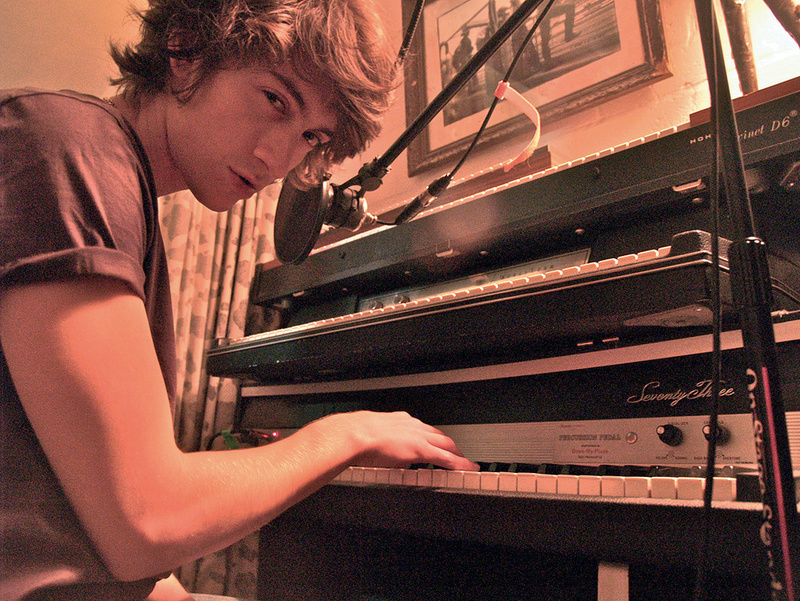 So how would he tackle a move into the producer's chair with British indie superstars Arctic Monkeys? Josh Homme and the Arctic Monkeys share a love of distorted guitars and rocking out, but other than that they come from completely different musical universes. Homme and his music are as American as they come. 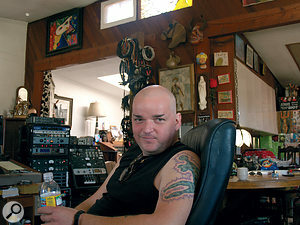 He's a man of the desert, having been born in Joshua Tree and grown up in Palm Springs, California; but while his formative musical experiences, with the band Kyuss and early Queens of the Stone Age, were heavy metal, he has since developed an impressively wide‑ranging array of talents and activities. Homme has collaborated with numerous people, among them Foo Fighters and Trent Reznor, and made a splash recently when he appeared on stage with John Paul Jones and David Grohl under the name Them Crooked Vultures. In the course of all this, Homme has been credited with performing on guitar, vocals, bass, drums, keyboards and xylophone, and as an engineer, mixer, and producer. Arctic Monkeys, meanwhile, are the archetypal northern English, rain‑drenched, working‑class Britpop band, complete with heavy Sheffield accents and lyrics dripping with humdrum details of daily life. 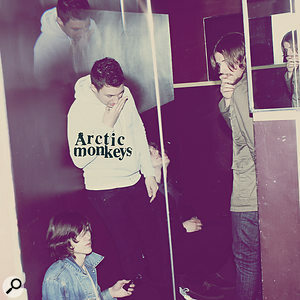 Their first album, Whatever People Say I Am, That's What I'm Not (2006), is still the fastest‑selling debut album in UK history, and like 2007's follow‑up, Favourite Worst Nightmare, was packed with frantic, double‑time post‑punk music. More recently, singer Alex Turner and fellow band members Miles Kane and James Ford pursued their love of '70s orchestral pop as The Last Shadow Puppets. Throwing Homme and the Arctic Monkeys together was always going to result in something unusual, but few people will have been prepared for the Monkeys' third album, Humbug. The frenetic rhythms have been greatly slowed down, with the band instead doing a lot of slow, low‑down riffing, and often striding waist‑deep into prog‑rock territory. Whereas frontman Alex Turner frequently half‑spoke or half‑spat his lyrics, he now positively croons, following in the footsteps of fellow northern singers such as Bryan Ferry and Morrissey. "The Arctic Monkeys were unlocking doors in the house that they live in,” recalls Homme, "which was great to be around and watch. From the first note that I heard for this record, which was a demo for the track 'Dance Little Liar,' I thought: 'I'll be damned, these motherf**kers want to paint landscapes.' Which is right dead in the centre of where I live musically. I reckoned that it was going to be fantastic, because we would be able to go down this path together and really enjoy it. I am also always on the search to try to do something that will be classic and will last forever. And the staging point for something classic is to find a weird chemistry, so that just the meeting in itself is a story to be told. "For as long as I've known the Monkeys, they've always wanted to play that most dangerous of games, which is to grow and change with each record that they made, while retaining their sense of themselves at the centre of it. It's the most dangerous thing a band can do, and also the most necessary. If you're lucky enough to be a musician, you have to take risks. If you risk nothing, you get nothing. 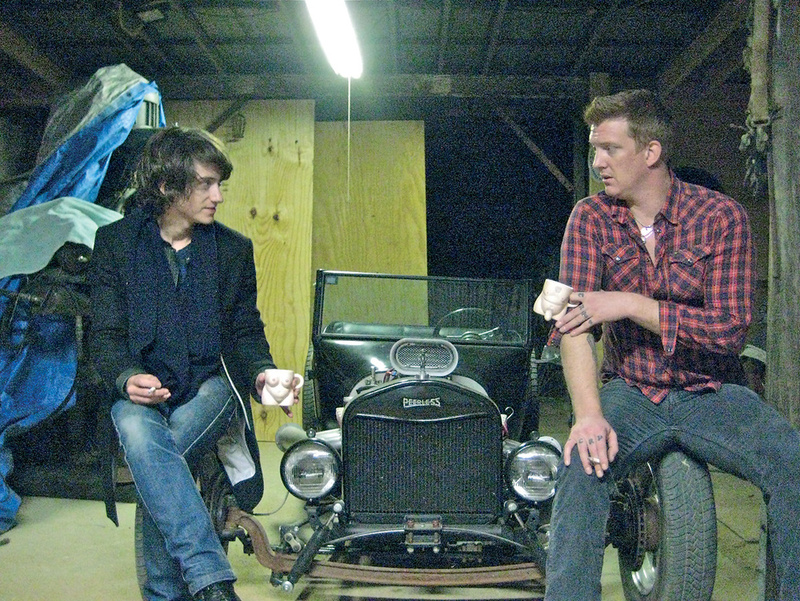 The choice of Homme as producer didn't come entirely out of the blue: the band and the American had met a number of times when on tour and shared a mutual appreciation, while drummer Matt Helders has named QOTSA as an influence. Initially, band and producer took, says Homme, an attitude of "Let's go and record a couple of tracks with no particular purpose in mind,” to lessen pressure and expectations. However, it soon became clear that the collaboration struck gold, and two sets of sessions were booked in September 2008 at Homme's favourite Rancho de la Luna studio, near Joshua Tree in the middle of the Mojave desert, with help from Homme's friend and collaborator, musician and engineer Alain Johannes Engineer Alain Johannes at Rancho de la Luna in the Mojave desert, where much of the album was tracked.. As the sessions unfolded, Homme was at pains to avoid imposing his own musical perspective. So what, then, about the apparent QOTSA influences in various songs? "When we discussed what they wanted me to do early on,” replies Homme, "I asked: 'If I have an idea, do you want me to tell you or not?' And I would ask the same question each time for each song. That was part of my job. Once everybody had done their thing, I would say: 'I have this idea, would you like to listen to it?' Some of these ideas they used, and some they did not. So I played and sang a thing or two here and there on the record, but it was not really for me to do. This was their record to make. I told them that I would probably get credit for the things that had come from the Monkeys themselves. With regard to the "wrong equipment”, Homme admits that he and Johannes in fact took quite a bit of what presumably was the right equipment to Rancho. 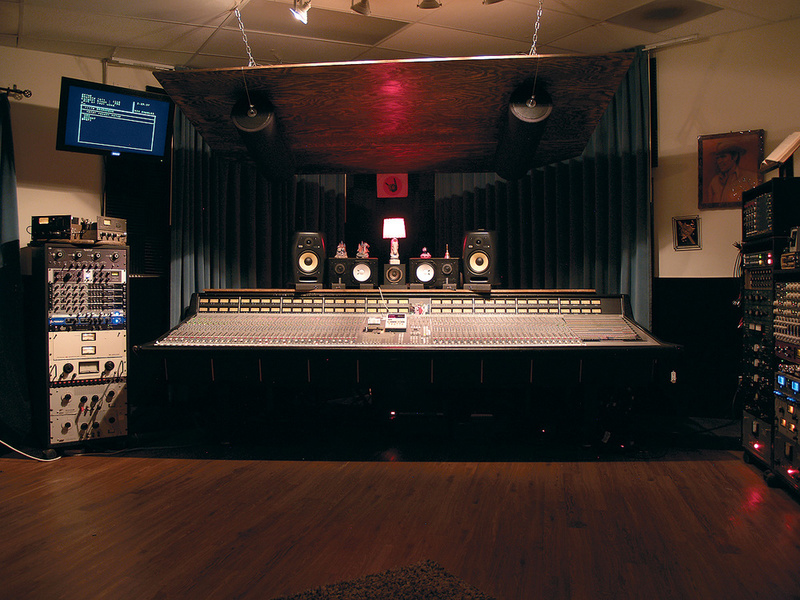 Homme: "The studio's gear is esoteric, with a Soundcraft desk and a Fostex 16‑track tape recorder. I brought my Eventide 2016 to Rancho, which is a great, versatile, variable reverb. I also took my Eventide H8000FW multi‑channel effects processor, because Rancho is quite small, and it allowed me to add four different effects at once. Other goodies that I took with me included Neve 1084 pres, API stuff, a Pultec EQ1A, some Tube‑Tech stuff, and some of my own compressors, like my Federal, my Department Of Commerce compressor, my Gates, and my Collins 26U. Homme discusses these details with enthusiasm, and it's no surprise to hear him say "I love engineering. 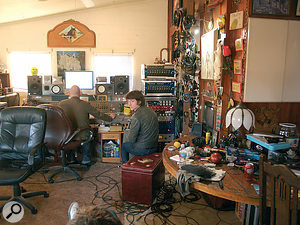 Carving sound, hearing it and knowing which microphone and microphone preamp combination is such a fun math problem solved.” It also becomes clear that, while Homme was credited as producer on Humbug and Johannes as engineer, in reality the labour division between the two was much less clear‑cut. "When Alan and I start working, we become so tangled and intertwined that we start looking like conjoined twins,” observes Homme. Humbug expanded the Monkeys' sound palette in numerous ways, among them the use of vintage keyboards. 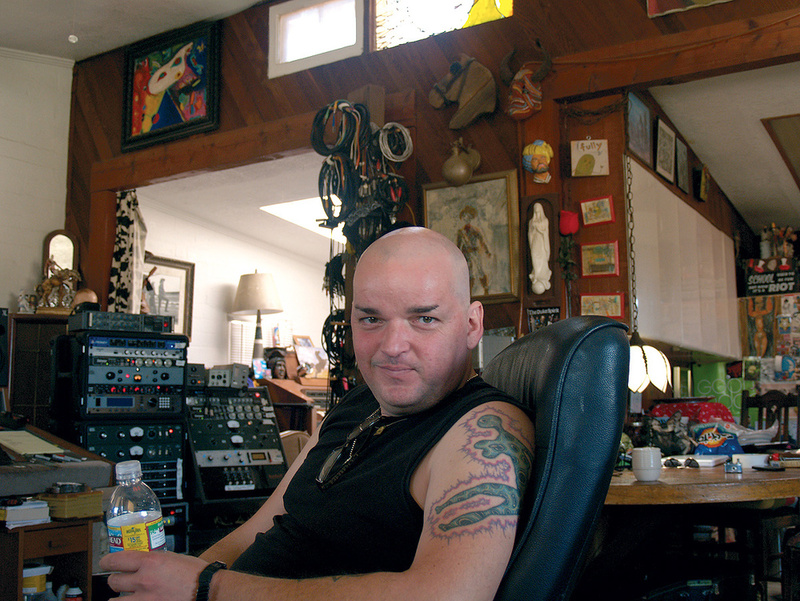 Homme: "For the Monkeys, the best thing in the studio is to play together as a quartet. It's uncanny how much that focuses them. 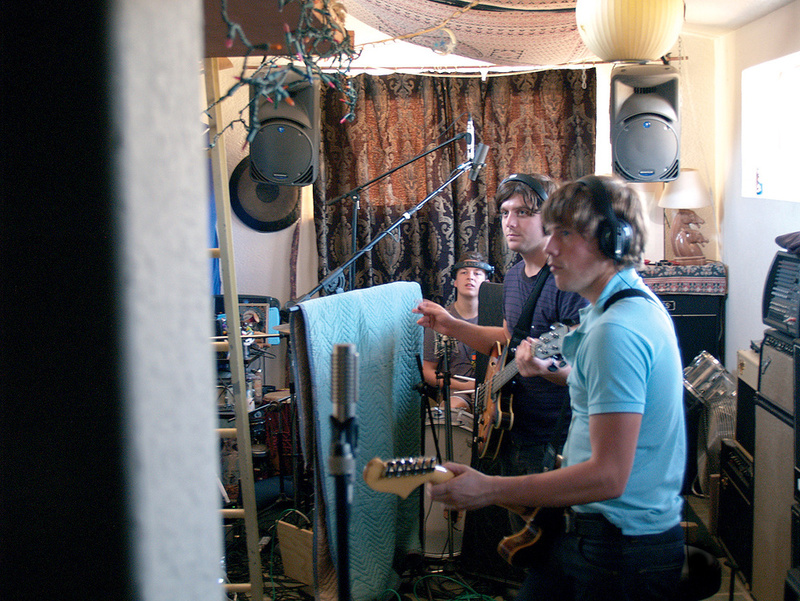 They laid down the basic tracks live, with Alex singing guide vocals that could often have been keepers. We almost always replaced the vocals, anyway, because they really deserved that focus and attention. But if the guide vocal beats the overdubbed vocal, then you know what to do. It does not need to be laboured. With each take you peel away some of your excitement. If you don't have a good take by take 10, you should move on and come back to it later. Also, we have this saying in the Queens which goes: 'This is where most bands stop, and this is where we start.' This refers to the details that go into a song, like an accent shot in verse two for no reason, and so on. What really excited me was that the Monkeys were also really into doing this detail work on the music. I respect that eagerness to craft songs. 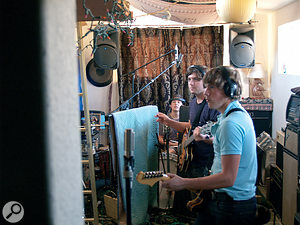 Johannes: "We also used some ribbon microphones on Alex's voice, for instance the Sontronics Sigma, or an old Sony. In a few cases we used an old Fender mic for a crap‑out distorted vocal sound. The distorted vocal sound in 'Dance Little Liar' was recorded with an old ribbon through the Thermionic Rooster and the Neumann through a Neve 1080 into a Neve 33609 compressor. I very often had two or three microphones on the vocals. We were not always using all of them, it was more a matter of having a choice, if we wanted the vocal sound to open up for the chorus or something. 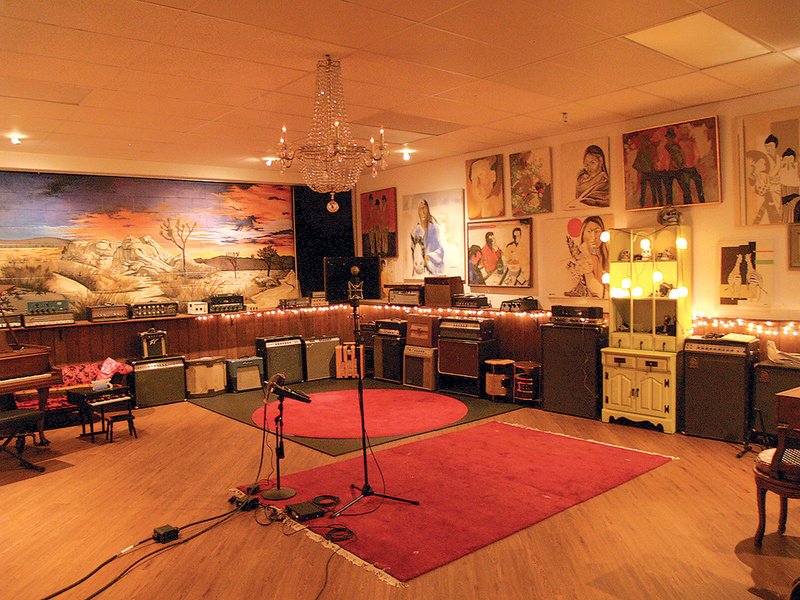 Homme's Pink Duck studio looks, according its owner, like a "bordello from the cowboy days” on the inside. The Rancho control room. The producer explains that the move from Rancho to Pink Duck was planned all along just in case the desert didn't pan out as a helpful catalyst for the band. Ultimately, however, they wanted more Rancho, more desert and more isolation. 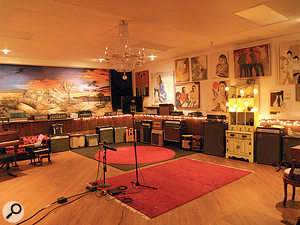 Several songs, among them 'Pretty Visitors', 'Dangerous Animals', and 'Dance Little Liar', were recorded from scratch at Pink Duck. 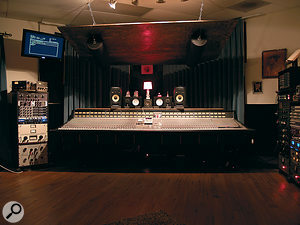 The equipment used at Pink Duck was as similar and varied as that in Rancho, the only major difference being Homme's SSL 4048 desk with G+ computer and E‑series EQ, which is, remarks its owner proudly, "the rock EQ”. Homme signed off at this stage, as his presence was demanded for other projects, which is why James Ford produced the band during the Mission Sound sessions. This meant a return to a more familiar team, as Ford had produced the band's second album and the Last Shadow Puppets' The Age Of The Understatement. The three tracks on the album produced by Ford are in the same vein as the Homme‑produced material, both musically and sonically. The latter aspect may have to do with the presence of Johannes, who also travelled to New York, at the request of the band, for the sake of continuity.